The Prime Minister, Shri Narendra Modi and the President of the United Republic of Tanzania, Dr. John Magufuli, at the delegation level talks, at the State House, in Dar es Salaam, Tanzania on July 10, 2016. India and Tanzania on Sunday agreed to deepen their partnership in agriculture and food security and work together in the development and use of natural gas as New Delhi committed more aid for this east African country's water supply projects.“We agreed that our common desire of economic prosperity for our societies is creating new opportunities for expanding our cooperation,” Prime Minister Narendra Modi said in a joint press statement with Tanzanian President John Magufuli following delegation-level talks here.“For this, both of us felt that we need to: One, deepen our partnership in agriculture and food security, including through enhanced export of pulses from Tanzania to India; two, work together in development and use of natural gas; three, partner in building of industrial economy, capacities and institutions in Tanzania; and four, deepen our trade and investment partnership by encouraging greater industry-to-industry ties,” Modi said. The partnership in the area of natural gas development and use is significant as Tanzania has been emerging as a gas giant with a series of finds since 2011.In March this year, a Dubai-based company said it has discovered 2.7 trillion cubic feet of gas in Ruvu Basin in the country's coastal region.Modi said that India was already a substantial economic partner of Tanzania and the whole range of economic ties were healthy and on the upswing. 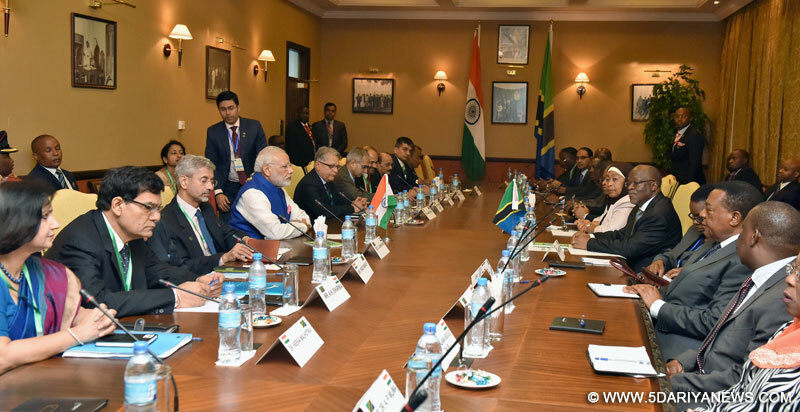 “Our two-way annual trade stands at around $3 billion, Indian investments in Tanzania already total around $3 billion and Indian businesses in Tanzania continue to grow and expand,” he said. Modi described as a “good achievement” completion of a water supply augmentation project in Dar-es-Salaam with the Indian aid of $I00 million.“We have just now also signed an agreement on water supply project in Zanzibar for a line of credit of $92 million,” the Prime Minister said. “We are also working on a number of other water projects for 17 cities. And for this, India is willing to consider an additional $500 million line of concessional credit.”India and Tanzania signed five agreements after the delegation-level talks, including two on water supply and water resource management. Modi flagged public health as another important priority in India's engagement with the east African country. “We are ready to meet the healthcare priorities of the Tanzanian government, including supply of medicines and equipment,” he said, adding an Indian radio-therapy machine was being installed at Bugando Medical Centre in the country's Mwanza city to treat cancer patients. The Prime Minister said education, vocational training and skill development were other areas of priority in which India was willing to offer all assistance.“Being neighbours across Indian Ocean, President and I agreed to deepen our overall defence and security partnership, especially in the maritime domain,” Modi said. “Our in-depth discussions on regional and global issues reflected our considerable convergence on issues of common interest and concern.” Modi said both sides agreed to work closely, bilaterally, regionally and globally, to combat the twin threats of terrorism and climate change and described Tanzania as a “crucial partner” in the India-initiated International Solar Alliance.. Prior to Sunday's talks, Modi was accorded a ceremonial welcome at the State House here.Modi also played a traditional drum along with Magufuli, adding a local and informal touch to the ceremony.Later, he interacted with a group of 30 African 'Solar Mamas', rural women who have been trained in harnessing solar energy under Indian government programmes. The Prime Minister also met members of the Indian community, which numbers around 50,000 in Tanzania.At a banquet hosted in his honour by President Magufuli, he described the Indian community as an important link between the two countries.After completing his engagements in Tanzania, Modi left for Kenya on the fourth and last leg of his four-nation African tour.The Prime Minister arrived in Tanzania on Saturday night from South Africa on the third leg of his Africa visit.This was the first prime ministerial visit from India to Tanzania in five years since the visit of then Prime Minister Manmohan Singh in 2011.He started his five-day trip with a visit to Mozambique.